The Pizza layout — a simple circle of track with scenery — is undoubtedly the world’s most popular layout design. So here are the latest pizzas that have reached this site… just in time to inspire you to construct a simple holiday railway! 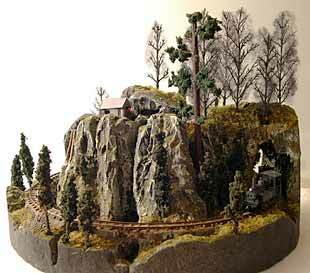 Steve Pettit, from Sydney, built this 860x600mm [34x24in] U.S. style pizza mining layout to show off the line of trees that he makes for other modelers in Australia (under the name Model Terrain Co.). 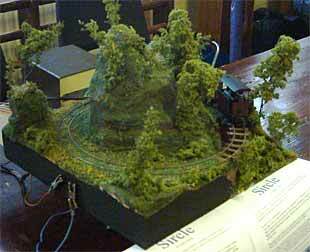 He built it in On30 [O16.5] scale as a change of pace from his large On3 home logging layout, the Toadcroak Flume & Lumber Co.The layout is mounted in its own carrying case complete with lighting, and the curves are as small as 230mm [9in] radius. 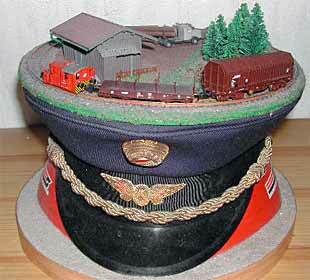 Herwig Gerstner, who lives in Wels, Upper Austria, made this charming N-scale pizza layout on a railwayman’s hat. The hat is mounted on a kitchen bowl painted with the railway color “vermilion” [“blutorange”]. Inside the cap is the 9V battery that runs the train. Herwig works for the Austrian Federal Railway. A couple years ago, he was reassigned to an indoor desk job, out of sight of the trains. “So the idea came to build something for my desk. The result was this layout beside my telephone.” he reports. Regular site visitor Hiromi Masaki, from Yokohama, shared this calling-card sized Nn2 pizza — it’s 3.75mm gauge, and it really is the size of a business card! “The yellow skip is freelanced, and the locomotive is motorized to an Nn2 diesel locomotive kit produced by Railino,” Hiromi reports. 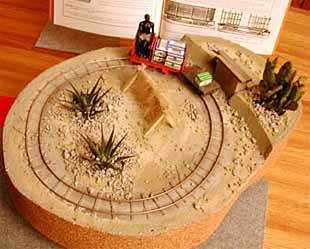 For more information and to see an amazing video of this layout in operation, visit Hiromi’s website. Robert “Dawg” Fales, from Bentonville, Arkansas, sent photos of his first Gn15 layout (that’s G scale trains running on HO tracks representing 15in gauge). It’s a big pizza with a single repair siding — take a look at the closeup for a taste of the incredible amount of detail that Dawg has included. In real life, he’s a motorcycle mechanic, so you’re likely to spot some meticulously crafted hogs on his G-scale pikes! For more, see his website. 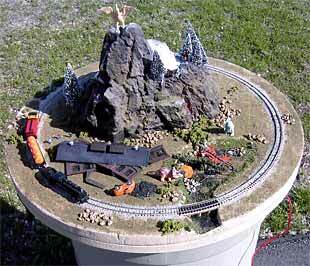 This imaginative N scale pizza was created by Pete Strutz, from Edgerton, Wisconsin. It represents a scene following a nuclear war, with destruction and collapsed buildings evident everywhere and mutant dinosaurs roaming the land. The lordly pterasourus atop the mountain is monarch of all he surveys, but not much is left. Pete doesn’t explain how the railroad survived so well, but it runs just fine. Recognition for the “most unusual benchwork of a pizza layout” goes to Gert Scheuermann, from Mannheim. He’s building the Rio Chama Railroad on a wooden cable reel that he picked up from a construction site! It’s a twice-around pizza, set in the American West. There’s more information — and an astonishing expansion plan — at Gert’s website. Also from Mannheim comes this remarkable pizza layout from regular contributor Alexander Lehmann. 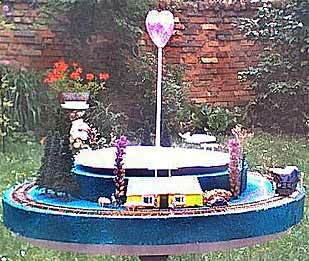 When his best friend, Walter, got married, Alex built this TT circle as a base for the wedding cake. It has three symbolic stations named “Verliebt, Verlobt, Verheiratet” (“Enamoured, Engaged, Married”). Electricity comes from two 4.5 volt batteries in the middle, and turning the heart works the on-off switch! The scenery includes several pigs, in accordance with the old German saying, “Da hast Du Schwein” (“You got a pig,” meaning “You’re very lucky.”). Don’t try that line in English! Klaus Komischke, from Köln (Cologne). made this unusual Gn15 pizza to represent a railway serving a sisal plantation in the Yucatan peninsula of Mexico. Highlight of the desert scenery are the live agave plants, which are the source of sisal (from which hemp is made). In front of the train is a drying rack for the bleached fiber. Klaus comments that the layout must be stored on a windowsill, to provide light for the living plants. Jon Songøygard, from Arendal, is still working on this attractive mountain scene for his OO9/HOn30 pizza. An “under-construction” photo of this layout was shown in our last Pizza Roundup. Actually this side of the mountain is nearly finished now, but he’s hard at work building a dynamite shed, water tower and coal bin for the other side. To keep track of his progress, consult Jon’s website. Peter Mesheau, from Sackville, New Brunswick, built this 3x3ft Gn28 pizza (1:22.5 scale running on 32mm O-gauge trackage). Rolling stock is all scratch built, and track is hand laid. The layout was exhibited in St. John recently and received considerable favorable attention. Our thanks to Jim Jones of Maritime Hobbies & Crafts in Halifax, who took the photo and sent it to us. 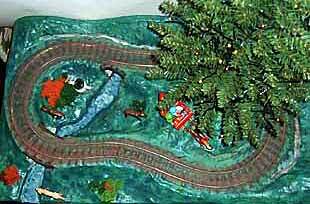 This sturdily built round-the-tree pizza is perhaps typical of what many model railway fans could easily do to combine their hobby with family holiday celebrations. 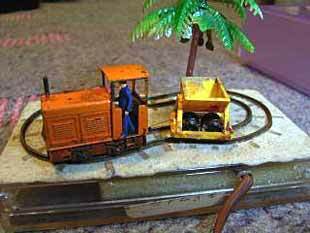 Peter Laband, from near Redditch, built this SM32 [16mm to the foot on O-gauge 32mm track] layout as solidly as possible to withstand the hard knocks of a family Christmas. The 31x19in layout is built from multiple layers of shutter board, so it’s very heavy. Accessories and details are mostly from Playmobil and are virtually unbreakable. 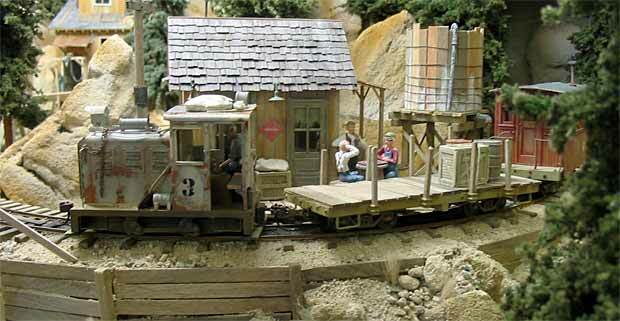 The rolling stock was scratchbuilt or made from kits by Peter. 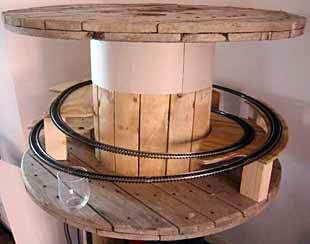 The layout sits atop a coffee table and has a hole drilled in it to hold the tree. 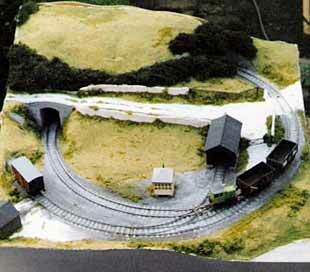 Matthew Scrutton, from Chertsey, Surrey, is modeling central Swedish metre gauge using HOe [9mm gauge] in this 60x60cm [2x2ft] pizza layout. 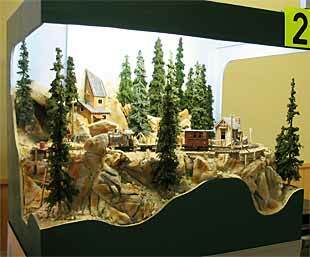 The layout’s name is Stopp Wotch Nordlig Ljus Jarnvag, which translates as the “Stoppenwotch Northern Light Railway.” Backdrop is from Peco — closest they come to Swedish scenery! Here’s an unusual item — a finescale pizza in OO [4mm to the foot]! Radius is about 10in, and the track was handlaid by Neil Rushby, from York. The layout was designed for pushbutton operation and went to a couple of local shows. 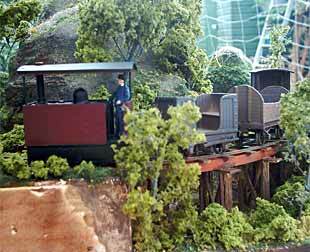 The train was concealed under the hillside at the rear and was set into motion when a spectator pressed the button. Overall size of the layout, since dismantled, was 2x2ft. Although it’s a bit larger than a typical pizza, this layout is a good example of the kind of simple display we’re trying to persuade you to construct for the holidays. 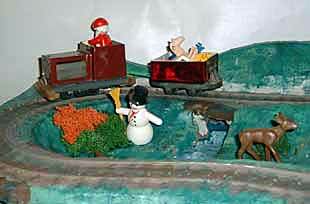 Ian Bareham, from Ipswich, used a cheap plastic battery-powered train set on a plywood base. All the structures are from plastic kits, children’s toys, or built up second hand ones from train store bargain baskets. The large Papa Noel’s toy factory started as a Hamster House with added walls and roofs. 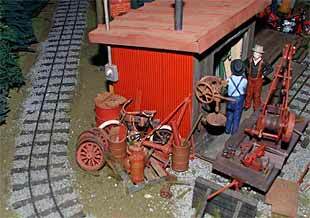 The depot is a N scale Pola Rico building with increased wall height and added HO doors. Ian put a set of Auto 12v Christmas lights inside the buildings and scattered snow to taste. Give you any ideas for a seasonal project?